Chubby-soled and you’re saying the brand name wrong – but here’s why Hoka one one’s ultralight kahas are need-to-know boots in 2019. Hoka One One is a brand you’re going to need to know about sooner or later. They’re a disruptor of conventional wisdom, and in spite of their almost wilful oddity (French company, Californian-owned, Maori-named, pronounced ‘Hoka oh-nay oh-nay’) it’s working: Hoka is the fastest-growing running shoe maker in the world. 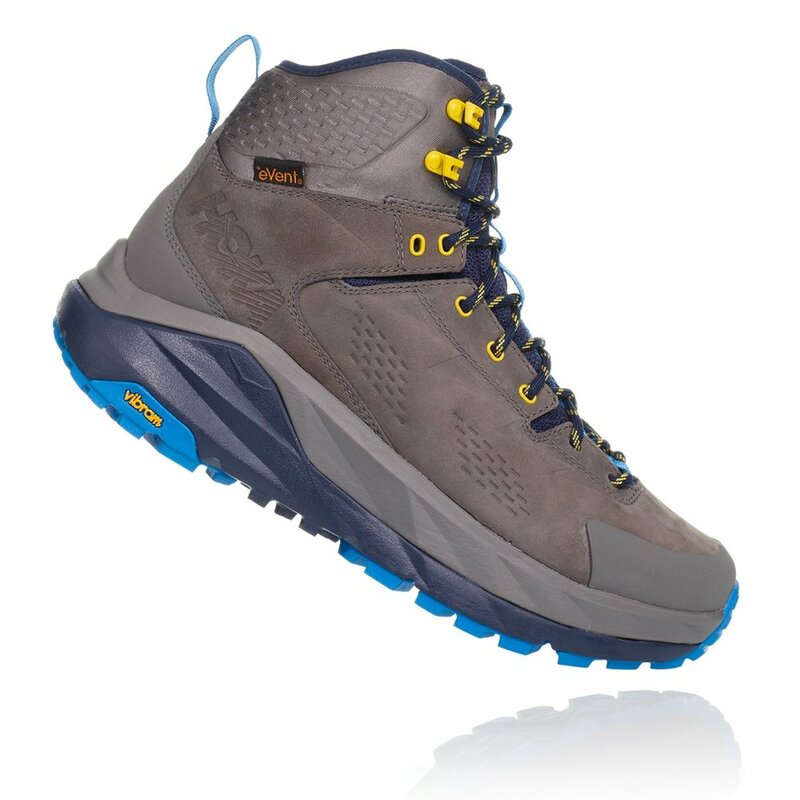 But their big ideas, they say, apply at least as well to walking as to running, as they launch their Sky range of boots – the scrambling-focused Sky Arkali (£170), speedy-hiker Sky Toa (£150) and the full-leather, waterproof Sky Kaha we’re focusing on here. The big idea is that for too long, boots have been too heavy, too unforgiving underfoot, and too clumpy and stop-start in the gait they enforce. From the moment you set off in the Kahas you get the idea. At 481g per boot (men’s size 7) they’re fully 20% lighter than equivalent conventional boots, and they feel trivially lightweight. A bit like that momentary feeling of weightlessness you get after taking off your pack at the end of a day’s walk. The spring in your step is consolidated by the shape of the sole, which has a heel-to-toe arc which gently urges forward motion in favour of standing still. But what strikes you most of all as you power off along stony, rooty or rubbly trails is the absorption provided by the Kaha’s gateau-like sole. Where before you could expect to deflect off roots, pivot over the top of sharp stones and have to plan each step with the avoidance of discomfort and the search for a stable foot placement upmost in mind, now you don’t. The Kaha’s soles – comprised of three generous layers of different density rubbers, in which your foot is comfortably cradled – act like balloon tyres, absorbing intrusions and establishing grip and stability quickly and carelessly. It’s liberating – and particularly advantageous going downhill toward the walk’s end, when instead of nursing tired feet and knees, you can stomp on down with abandon. The extra width of the oversized sole makes going over on your ankle almost impossible to do too. Part of what makes the Hokas look unconventional is the absence of a heel breast – the step separating heel from instep and forefoot, which from time immemorial has been a boot-sole hallmark. Hoka’s instep instead is filled with lugs – more than enough extra surfaces perpendicular to the direction of travel to perform the heel breast’s ‘handbrake’ function says Hoka – while being formed out of softer rubber, meaning the instep is still there when you need it, like when you’re stood across the crest of a sharp boulder and need that anchored feeling. Hoka says in its early days ‘we knew people were laughing’ when they saw their running shoes, but that scepticism never survived a road test. Its Sky Kahas – styled to be less alienating than its earlier offerings, yet still unmistakably different – face a lower hurdle, perhaps, but a hurdle still. Don’t dismiss them. They might look like anti-gravity boots from the future, but in some ways they really are. And they’re certainly the most stable, untiring, and lightest full-leather boots you can buy today. + ultraLight, grippy, stable and they leave your feet remarkably untired and untender. – Hoka’s ‘bucket seat’ design achieves stability without a stiff upper, so the boot hasn’t got that ‘armoured’ feeling you may like in a leather boot.